Size of Male: 90-120 lbs., 25-27.5 in. Size of Female: 70-100 lbs., 23-26 in. The Bernese Mountain Dog is a handsome breed with a notably long, silky coat, and is ironically gentle for its formidable size. A cabin or a house in the Alps where snow is abundant, and sled rides and snow fights are common would make the Bernese Mountain Dog feel right at home. Sadly, even with the most loving owners, the breed cannot survive in the tropics. Records estimate that the dogs existed earlier than 20 centuries ago, when the Romans marched into Switzerland. Farm life is not new to the breed. They pulled carts, herded cattle and served as loyal companions to farmers. Today, most Berners have retired from their farm duties and now function as pets. This breed is affectionate by nature, friendly with kids, wary of strangers and quite attached to human companions. The males tend to be hostile to other male dogs, however. Generally, Berner puppies are playful, but once they get past adolescence, they become the mild-mannered house pets you like them to be. Many Berner mountain dogs are noticeably shy, too. This is mostly because of inadequate socialization during their early years. The breed is likely to suffer from separation anxiety, so it’s not a good idea for you to leave the Berner at home by itself. Living Environment – A spacious home located in cool regions of the Earth is the ideal living environment for this dog breed. Cramped spaces will make movement cumbersome for the large and heavy Berner. A yard is also ideal, since these dogs savor the great outdoors, especially snow-covered ones! High room temperatures are not for these dogs. If you live on the sunny side of the planet, you may want to get another dog breed as a pet. Grooming – Although seasonal shedders, the breed has a double coat which will require regular grooming. It’s alright to brush the dog’s coat twice a week, but a daily basis is ideal. They can also make a mess out of themselves by slobbering while eating. Luckily, daily baths are not mandatory. You can give your dog a refreshing shower-and-shampoo session once every 2 or 3 weeks. Diet & Exercise – When it comes to diet, this large dog breed has no particular favorite, but puppies must be served puppy food until their fourth month. Some owners also suggest that a healthy meal consist of no less than 4 percent fiber, 20 percent fat and 30 percent protein. The breed has a tendency to suffer from bloats, so avoid overfeeding your pet with kibble. Berners have moderate exercise needs. They may be outgoing, but they lack the endurance to sustain physically strenuous events for extended periods. Therefore, some frolicking in the yard or snow will suffice for them. Their phenomenal bursts of speed can quickly subside once the Berners have had their fill of pulling a sled or playing a game of fetch with you. Health – For a breed plagued with serious dog health problems, a short life span of 7 years is not surprising. In fact, statistics reveal that a Bernese Mountain Dog aged 9 or 10 is rare. 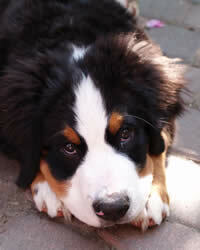 Numerous types of cancer are hereditary in Berners due to inbreeding. Other major health concerns include elbow and hip dysplasia, kidney malfunction, osteoarthritis, epilepsy and heart diseases. Their eagerness to please and their intelligence make the Bernese Mountain Dog trainable. There’s a catch though: Your pet takes an unusually long time to mature, so training your dog is actually like teaching a very intelligent but young child how to do things. Your Berner needs patience, positive reinforcement and consistency to get things right. Establishing an early obedience routine is strongly suggested. Hoover, our Bernese Mountain Dog, is now 14 and a half months old. He is a very sweet and loving dog. The only drawback is his size.